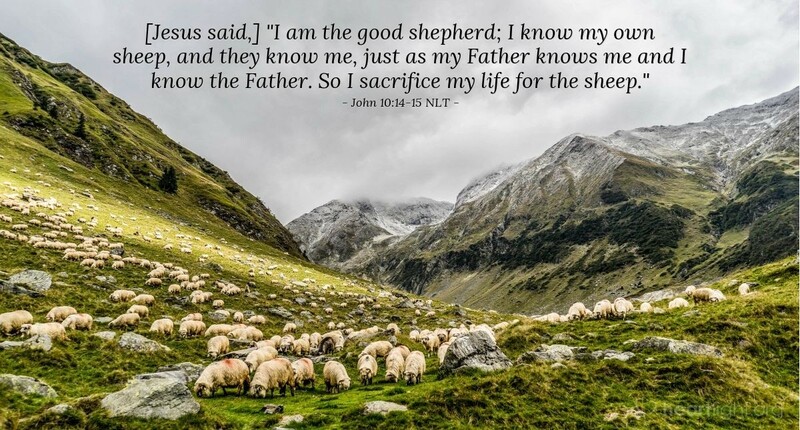 [Jesus said,] "I am the good shepherd; I know my own sheep, and they know me, just as my Father knows me and I know the Father. So I sacrifice my life for the sheep." Jesus knows us. He knows our hearts. He knows our fears. He knows our temptations. He knows us inside and out. Any attempts to pretend would be in vain. We do not have to be afraid in his presence. We know he wants what is best for us. He demonstrated it by allowing himself to be born into our world and placed in a feed trough in a stable at Bethlehem. He made it clear by allowing himself to be arrested, mistreated, falsely tried, and then crucified on the cross at Golgotha. Father, because of your love and because of Jesus, who is interceding for me now, I pour out to you my deepest concerns: ... I know you will hear my cries and minister to my needs. I do not mean to be selfish today, O God, but I do want to be honest in your presence knowing that I can come to you sincerely and receive your grace. Thank you for your immeasurable love, understanding, and assurance which were given to me at such a high price. In Jesus' name, I pray. Amen.